Through destruction, Celestial Being will bring rebirth to the world: Eradicating war by means of armed interventions. The year is 2307 AD. As three superpowers, the Union, the Human Reform League, and the AEU, are vying for global influence, the private armed organization ''Celestial Being'' suddenly appears. Celestial Being, using the mobile weapon Gundam in an attempt to eliminate war, brings astonishment and chaos to the people of the world with its contradictory actions. Before long, it begins to provoke even hatred and anger. However, this will become the power to compel the world into a drastic reformation. Contains episodes 1-3 of the Mobile Suit Gundam 00 OVA Series. 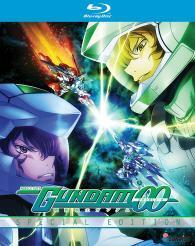 Bonus features: Clean Endings and Gundam 00 Movie Preview Promotional Video. Audio: Japanese; Subtitles: English.